Many people seem to be confused by the tipping culture in Berlin – or some would probably even say the non-existing tipping culture in Germany. Something that is rather obvious to me and probably also the average Berliner seems to be a miracle to visitors, guests, tourists – nuBerliners. Maybe tipping in Berlin does work different to tipping in other cities, other cultures – here I’ll try pinpoint some of the tipping facts you probably should know. First of all: of course tipping is welcome in Berlin – at least in most places. Trying to tip the dentist may however be considered inappropriate – tipping somebody at the city administration may be actually be considered bribery – which can bring you into trouble, since that is illegal in Germany. But tipping the taxi driver, the hair dresser and the staff at the local restaurant is considered normal. In my experience not tipping at any of these occasions would actually be considered rude. Where to tip? How much should I tip? Basic rule of thumb: if there is service, there should be a tip. I would suggest the amount of tipping should range anywhere between 10% and 20% of the receipt – other people may suggest it should range between 5% and 10%. Anyways – more is more. And if you really don’t want to give a tip, then of course you don’t have to. But that may be interpreted as a rather rude statement. In a restaurant you would usually give a tip of around 5% to 20%. Most people probably stick to the 10% rule – but of course you are allowed to leave as much tip as you like. There is no “too much” in tipping – nobody would be offended if you tipped more than the usual customer. In a fast food stand, buying a Curry Wurst or a Kebab tipping is not really expected. Usually you would pick up your food from the desk – but even if it is delivered to your table a tip would not be expected. It would however probably be welcome. In bars and cafés it’s less common to give tips, but it is just as appreciated as it is in restaurants. Actually the German expression for tip would be Trinkgeld – which means something like drink money. Anyways. When ordering and paying a drink at the bar desk an extra 50 Cents or a Euro is most likely appreciated by the bar staff. When ordering something fancy like cocktails or expensive Whiskey you may of course also give a higher tip. Again: more is more. In some cafés you may find a Tip Jar by the counter. Use it. That’s what it’s there for. Also at the hair dresser and at the barber shop at tip is basically expected. Just as many others working in service those people usually don’t get paid very well – so hair dressers and barbers partly rely on the customer tipping. Again: everything between 5% and 20% would be considered polite. Alternatively you could also calculate the tip by the hour: an extra 5 Euro per hour is just nice. I have the feeling that it’s not so common any more to actually tip the Taxi driver. Again: these people do not really earn high wages and partly rely on the customer tipping. Also in taxis everything between 5% and 20% would be considered polite. You can also ask for a receipt including the tip – so if you happen to get the money back from your employer or if you put the receipt on your tax report the tip won’t be your loss. This one is an important one for me, since my very first Berlin job was working as a Pizza Delivery Boy. Please do tip the person delivering fresh food to your doorstep. Food delivery can be a tough job, and often it is not well paid. Especially people working for companies like Liferando or Deliverydoo would probably appreciate you extra tipping them. They are usually independent contractors, self employed, for whom minimum wage laws, sick pay, paid holidays and so on do not apply. So even if you already paid your food online, please do tip those heroes and heroines that are actually dragging your dinner to your apartment door. How to actually give tips in Berlin? Probably the most common way to actually give the tip is when the restaurant waiter or taxi driver presents the bill to you – or simply tells you what you have to pay, then you quickly do the maths and tell them either what you want to pay, or what you expect as change. If you are dealing with obvious / round numbers then saying something like “Danke!” (thank you!) or “Stimmt so” (that’s fine) will be understood. So for example the waiter asks you to pay 18 Euro you could either hand over 20 Euro and say “Danke!” – or if you instead want to get 1 Euro back you could say “neunzehn bitte” which would mean “make it 19 please”. Leaving the money or just some change for a tip on the table is not really common – but it also works in most places. Depending on the area you could however run into the risk that somebody just takes the “extra” money – and either runs off, or runs after you, expecting that you forgot to take your money. What if I pay with credit card / debit card? So you find yourself at a restaurant without any cash at hand? Or you didn’t make it to the money exchange place Wechselstube yet and have one Dollars / GBP on you? No matter what occasion, of course you can also give a tip if you happen to pay without cash. You can either ask the staff to add the tip you want to give to the bill – or pay by credit card and add the tip in cash. Either option will be appreciated. In which restaurant are you working? Somewhere in Unter den Linden, where Americans come after visiting Checkpoint Charlie? In fact, most waiters do not expect tipping, and are quite happy if they receive something like 8 percent. I just gave 8 % and the waiter was very happy. I am actually not working in a restaurant. Are you? Probably not. As I said above – of course you are allowed to leave as much tip as you like. But there is no “too much” in tipping – nobody would be offended if you tipped more than the usual customer… Cheers! Tipping is neither common nor expected in Berlin. We don’t want to import a US system where employers can get away with paying less than minimum wage on grounds of tip-based salaries. Take my advice, don’t ever feel obliged to leave a tip in Berlin – only tip if you feel you want to i.e. because of really great service and/or a very tasty meal – nobody will bat an eye if you decide not to. Wow! Thank you for your suggestion/comment – I suppose you have never actually worked in Service…? This is not my experience of living in Berlin. You can, of course, leave as much as you want. However, 5-10% is the standard and in my experience and closer to 5% seems to be the norm, with not at all being common as wel. I live in Berlin, have many German friends in the UK and in Germany as well. Some of whom do work in the service industry in Berlin, or have done. 5-10% is what they say is the norm, if a tip is given at all. 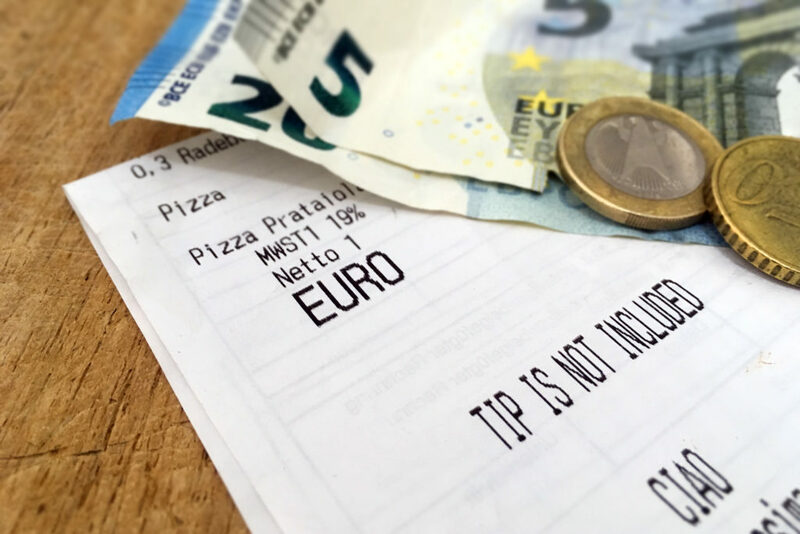 Most of Europe is not tip based and tips from the natives are often not expected. The other poster’s comment about the importing of Norther American style tipping culture is spot on, in my experience. 10-20% is simply unheard off. In most cases people round up. €9-10 then pay €10, €28-30 then pay €30. Whether one has worked in service is not the issue, I have, but not in Germany. The issue is one of cultural norms and expectations. Another issue with your post that needs clarified is the credit card issue. Restaurants that accept card do allow you to tip on the card. There is no need to tip in cash separately. A waiter told me that all cash or all card is best and he prefers not to split it. You simply do as you would if it were a cash transaction and tell the waiter how much you want to pay. The card reader will often have a ‘tip’ function. Paying it on the card is fine and it does go to the staff. I asked several waiters when I have had to do this. Though, in Berlin you are better to always have cash. Many places (even those you would expect to) do not take cards. Always better to have cash on you just in case. Thank you for your comment and your suggestions – I did some minor modifications to the text and hope that the picture is now a bit more accurate. I have to say I m amazed by some comments I ve read. The truth is tipping is not obligatory in Berlin or anywhere else in the world except US I guess. Tipping at least where I m from (Greece) is like more in a form of saying an extra thank you to the waiter for going over and above. Which means if you are very satisfied with the service provided, you would probably express it with tipping. So as a rule of thumb as you say , is to leave a tip of the amount you feel like the waiter deserved. Which can also be 0 obviously. I usually leave money on the table, because that’s how we normally do it, and none has run after me so far.